This extends not only to the apps being used on a daily basis, but also to managing your G Suite billing and account from the Admin Console. Most of your company details, security settings and payment options can be managed from here, including; company profile and logo, new users, password resets, primary contacts and security settings. However, there are some key settings that cannot be amended from the Admin Console, which you will need the help of either Google Support or a Google Cloud Partner for. In this blog, we’re going to cover all of the administrative tasks involved with managing a G Suite domain, such as billing, company details, new and suspended user accounts and switching currency. Google accepts payments for service subscriptions in more than 230 countries using major credit cards, including Visa, MasterCard, and American Express. In some locations, you can also pay by direct debit from a bank account. 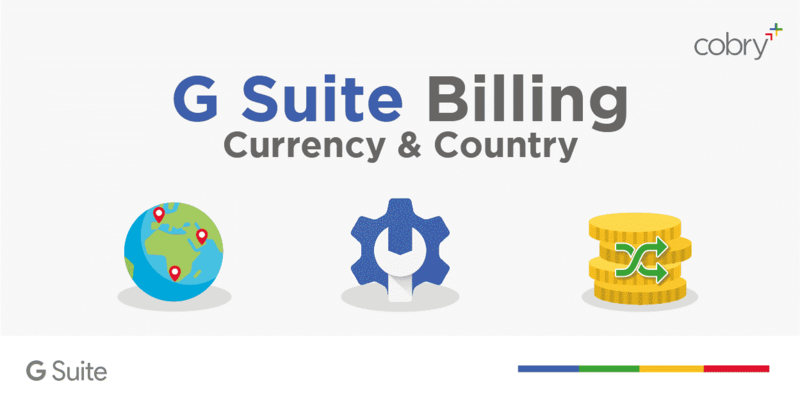 The exact payment methods and currencies you can use depend on the country you select when you first set up your G Suite domain. You can see the options available in the UK below and the rest of the world via this link. If the payment method you want is an accepted form of payment, but does not appear for your country, contact your Google Cloud Partner, or get in touch with us at info@cobry.co.uk and we would be happy to help you with this. Google Cloud Partners are also able to accept different payment methods, such as bank transfer. If this was your preferred payment method, you can get in touch with Cobry to arrange an update to your G Suite billing. Flexible Plan – You’re billed on a monthly basis for each active user account. Annual Plan – By committing to a year of service, you can gain a discount for a minimum number of licenses. Regardless of your payment plan, you can add new users to your account as and when required. This will lead to an increase in your payments to cover the new licences. However, when using an annual plan, you can not remove user licences until it’s time to renew your contract. If you need to add new users, you can either purchase licences from your Admin Console if you’re in a contract directly with Google, or you can ask your Google Cloud Partner to provision the licences and create the user accounts for you. It’s recommended that if you have an Annual Plan with Google, that you set up an automatic renewal so that you don’t forget to renew and end up with a service interruption. Alternatively, you can switch to a Flexible Plan at the end of your contract which will renew on a monthly basis and allow you to add and remove users as required, at any time. If you have an agreement in place with a Google Cloud Partner, then you may have more options in terms of renewal, such as an annual commitment – paid monthly. This brings all the benefits of locking in a lower price but also helping cashflow by paying monthly. If this is something of interest, you can contact Cobry via info@cobry.co.uk to arrange. If you’re contracted directly with Google and your automatic payment fails, you will have 30 days to update your payment method or your service will be suspended. When this happens, you can lift your suspension by paying your balance. If your licences are provided by a Google Cloud Partner, then they may have different terms and conditions. For example, Cobry provides businesses with an invoice and flexible billing options to lower the risk of account suspension. If your business has moved since you set up billing for your G Suite domain, you can update the address in your Admin console. (See next section below for updating Country and Currency). Use an administrator account to open the Google Admin console. From the Home page, go to Billing. Next to your subscription, click Actions > Access billing account. Under Settings, click Manage Settings. To the right of Business name and address, click Edit. Update your business address and click Save. When you first set up, choose your country and currency carefully, as you can not change these selections by yourself. To update this, you must contact your Google Cloud Partner, or contact us at info@cobry.co.uk and we can do this for you. If you don’t currently have a Google Cloud Partner in place, there are definitely good reasons to consider partnering. Some of which can be found below. If you would like to find out more about managing your G Suite domain, or you’re interested in having Cobry manage it for you, you can get in touch with us at info@cobry.co.uk and we would be delighted to have a chat.